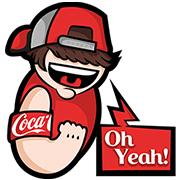 http://www.line-stickers.com/ – Iconic Coca-Cola + Happy Friends + You Rock Line Sticker + Caps | Here’s a classic pack from Coca-Cola. Spread your love for Coke with these stylish new stickers! If you’re happy and you know it and you really want to show it, share these cool stickers with your friends! It’s always better together. You know you want this exclusive sticker pack designed by you, for you. Share these cool stickers with your friends and ROCK ON! Hang on to your caps! Enjoy yourself this summer and add some fun Coca-Cola caps to your chats. Available till September 4, 2015.